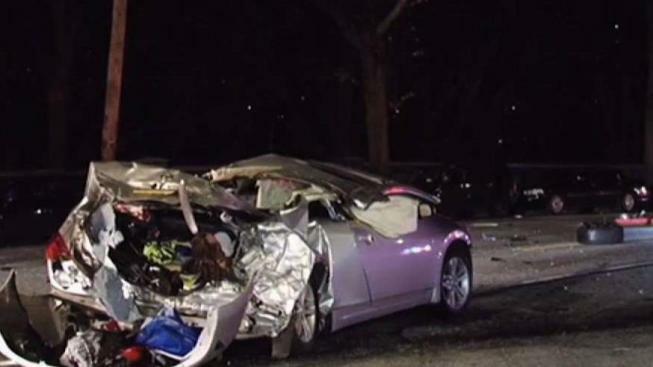 A drunk driver caused a chain-reaction crash involving five vehicles early Saturday that killed a man and injured a woman, police said. The collision began when a black Jeep, driven by a 54-year-old man, T-boned a Nissan Altima on Burke Avenue in the Bronx shortly before 3 a.m., the NYPD said. The Altima spun out of control and hit another car, police said. The driver of the Altima, Shiquan Dunn, 31, was killed, police said. His 28-year-old passenger was injured but is expected to survive. The driver of the third car, a 48-year-old woman, was also injured. She was in stable condition at Jacobi Hospital. The Jeep continued to hit two parked cars, police said. The driver of the Jeep, Andres Mayora, was taken to Jacobi Hospital and charged with driving under the influence and driving while ability impaired, police said. It wasn't clear whether he had an attorney.